Battalion 28 AOS with a 2-story garden style apartment with fire visible from the roof. 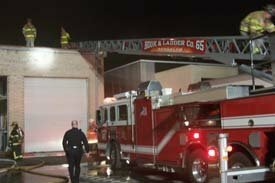 Squirt 44 went in-service with a 1 ¾ waterline while Ladder 65 opened up the roof. Quint-28 pulled an additional waterline to the exposure apartment and all other units stood by on the main drive. The fire is under investigation by the Bensalem FMO. Chief 65 AOS of a 50 x 125 one story commercial building with light smoke showing. Chief Harris assumed Newport Command and placed 2 and 2 in-service. Squirt 44 went in-service with a 1 ¾ waterline; Ladder 65 put its main to the roof and split the crew , opening up the roof and interior operations. Interior crews reported a heavy fire condition in the rear of the building and requested an additional waterline be placed in-service. Engine 88 went in-service with the additional 1 ¾ waterline and backup the initial crew, while Tower 11 assisted the 1st in Truck Company on the roof. Engines 65, 44, 28 staged there apparatus on Bridgewater Road and advanced there manpower up to Side A of the building and formed a manpower pool. The fire was placed under control in approximately 15 minutes. The fire is under investigation by the Bensalem Township FMO. Chief 65 AOS at the Gulf Station (Neshaminy Blvd & Bristol Rd) with 1 vehicle overturned on its roof with a subject heavily entrapped. Engine 65 and Rescue 84 went in-service with vehicle stabilization and the removal of the driver side door. Engine Companies 44 and 88 staged their apparatus and had their crews assist with the rescue. Medic 186 transported the patient to FTH. Deputy 65 AOS of a 2 vehicle traffic accident with one subject entrapped in an overturned SUV , Rockhill Drive at Northbound Route 1. Engine 65 preformed vehicle stabilization while Rescue 84 & Rescue 9 went in-service with removing the driver side door. Medic 186 and Medic 185 transported the injured to a local hospital. Station 4 & Station 65 were dispatched for an alarm activation at Betz Labs on Somerton Rd. Upon arrival Engine 65 was advised by Betz staff members of a chemical explosion in one of the labs. The assignment was upgraded to a haz mat response and crews stood by until the arrival of the Bucks County Haz Mat Team (Station 89). Chief 65 AOS of a 2-story garden style apartment with light smoke showing from the eves. Engine 65 took the plug at the main entrance of complex , and hand stretched 400' of 3'' supply line to an apartment pack and went in-service. 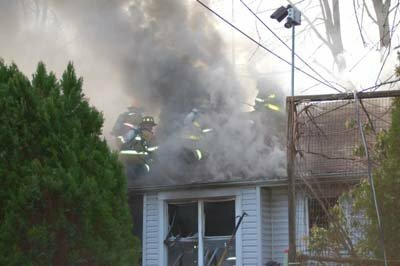 Ladder 65 took side C of the apartment building and opened up the roof and sofit area around a porch overhang. Additional manpower from Engine 44, Engine 11 and Quint 28 assisted 65's crews on side C of the building while all other units staged. A total of 4 apartments were damaged, including 2 common hallways. The fire is under investigation by the Bensalem Fire Marshal's Office. Rescue 84 AOS of a 2 vehicle traffic accident (Rockhill Drive and Horizon Blvd.) and reported one subject entrapped. Engine 65 stabilized the vehicle while the Rescue went in-service with removing the passenger side door. Medic 186 transported the injured to a local hospital. Chief 1 Arrived on location of a single family dwelling , with heavy fire showing and upgraded the assignment. Engine 65 was originally dispatched for the cover at station 6 was quickly added to the scene and put in service with roof operations. Engine 1 arrived on scene of a 2 story split level dwelling and encountered a heavy smoke condition inside the residence , and fire in the walls & ceiling on side D of the lower level. Chief 1 established command and struck the box. Ladder Co's 2 & 65 were put in service along with Engine Co's 1,4, & 6. Chief 11 AOS with a one story commercial building with smoke showing. Deputy 44 established Newport Command and placed Ladder 65 and Engine 44 in-service. Interior crews reported fire in the ceiling above the office area with extension to the roof. Tower 11 assisted Ladder 65 with roof operations. All hands were placed in-service and an additional Engine, Ladder and Rescue were added to the scene by command for additional manpower. The fire is under investigation by the Bensalem FMO. Engines 1 and Engine 6 were initially dispatched for a report of wires arching from a pole in front of a residence on Central Ave. Engine 1 AOS and reported smoke showing from a 2 story dwelling, Engine Companies 1 and 6 went in-service with an 1 3/4" waterlines and reported a fire condition in the basement. Ladder 65 vented the dwelling and preformed salvage and overhaul operations. Special Service 84 stood by as the RIT. Engine 11 AOS of a 2 story commercial warehouse with smoke showing. Engine 11 and Tower 37 went in-service with 1 3/4" waterlines, while Truck Companies 65 and 11 went in-service with roof operations. The fire was contained to a 2nd floor office and break room. All hands were placed in-service by command. The Bensalem FMO is investigating the cause of the fire. Engine 65 was originally dispatched for a report of an automatic alarm in B-Building of Bucks Crossing Apartments. While enroute Bucks County Radio advised the Engine that the assignment was being upgraded to an apartment fire. (PD were on scene reporting a kitchen fire in apartment B-7) , Engine 65 arrived on location and went in-service and quickly extinguished a kitchen fire that had extend into the living/dinning room of the fire apartment. Ladder 65 checked for extension and preformed ventilation operations. Battalion Chief 44 had command. 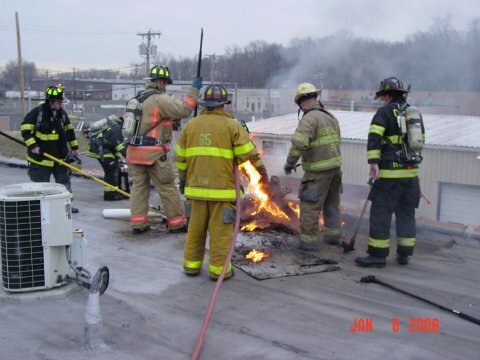 The fire was investigated by the Bensalem FMO. 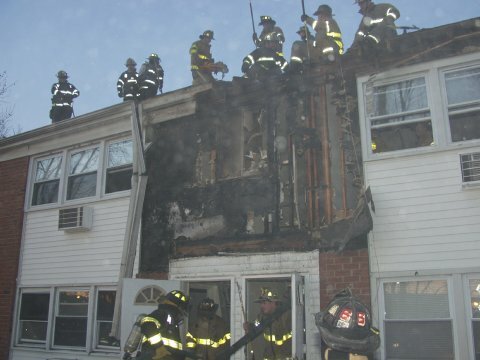 The Bucks County Chapter of the Red Cross temporary relocated the victims of the fire. Deputy 65 AOS and advised the county that he had a maintenance worker with severe burns to his face, neck, hands and arms. A flash fire occurred when the workers were relighting a natural gas boiler in D-Building. Ladder 65 and Tower 16 checked the boiler room of D-Building for extension and monitored for gas readings. PECO Gas and the Fire Marshal were called to the scene. The worker was transported to FTH by Bensalem EMS. Newport Command added Ladder 65 and Rescue 84 to the scene of a dwelling fire at 1113 Alberta Ave. Command reported they had a 1 story single family dwelling with fire throughout the attic. Crews were on-location for an extended period of time with overhaul and extension. Bensalem FMO is investigating the cause of the fire and no injuries were reported. Chief 65 arrived on scene with 2 Children stuck inside a Carnival Ride approximately 20' in the air. Ladder 65 used an extension ladder to gain access to the ride and then removed both of the girls from the ride without further incident. Township Inspectors closed the ride until a further inspection could be conducted. Chief 44 AOS of a one story dwelling and report heavy fire from showing Side A of a 1-story dwelling. Command placed Engine 88, Squirt 44 and Ladder 8 in-service and added Ladder 65 as the R.I.T. Medic 186 transported a resident of the home to FTH (later transferred to Temple Burn Center) with first and second degree burns to his face and neck and smoke inhalation. The Bensalem FMO is investigating the cause of the fire. 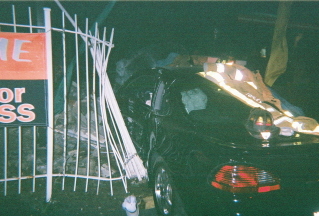 Engine 65 was originally dispatched to assist Medic 186 at the scene of a one vehicle traffic accident NB Route 1 at Street Road, but while en-route the Engine was advised that Bensalem PD were on-location reporting a vehicle overturned, fully involved, with a possibility of people entrapped in the vehicle. Deputy 65 AOS and reported the vehicle was fully involved , however the occupants of the vehicle had self-extricated themselves. Engine 65 went in-service with a 1 ¾ waterline and quickly extinguished the fire and assisted EMS with patient care. Engine 65 was dispatched with Station 28 to Byberry Road and Hulmeville Road for a 2 vehicle MVA with entrapment, Deputy 65 AOS and reported no entrapment. Upon taking up from the Hulmeville Road MVA, Bucks County Fire Radio advised Deputy 65 of a one vehicle MVA with entrapment on Galloway Road near the Pennsylvania Turnpike , with reports of an electrical pole and wires down on the roadway. 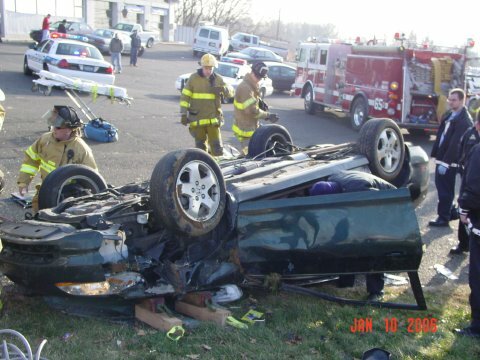 Engine 65 and Medic 186 went in-service with extricating a male subject from the vehicle. All patients were transported by Bensalem EMS to Frankford Torresdale. Deputy 65 AOS of 2-vehicle MVA with one subject entrapped, Engine 65s crew went in-service stabilizing the vehicles , and were able to gain entry into the vehicle and extricate the victim through the driver side door with hand tools. Medic 186 (Bensalem EMS) transported one patient to FTH. 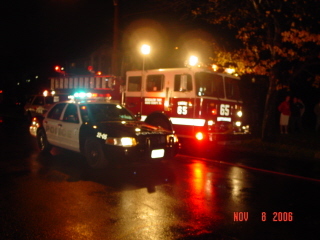 Engine 65 remained on scene for an extended period of time to provided lighting for Bensalem PDs investigation. Deputy 44 AOS of a 1 story commercial building with light smoke showing. Engine 12 and Squirt 44 went in-service to the interior and Ladder 65 preformed roof operations. Crews reported the fire was contained to an industrial oven and its duct work. No injuries were reported and the Bensalem Fire Marshals Office is investigating the cause of the fire. Ladder 65 was added to a dwelling fire on Chestnut Wood Lane Tuesday afternoon, Chief 37 reported fire showing from the 2nd floor of a dwelling. Crews quickly knocked the fire down. 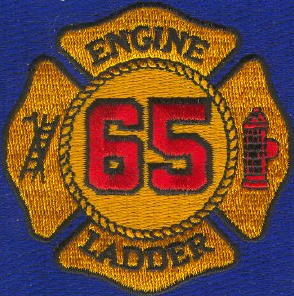 Wednesday afternoon Ladder 65 was added to a dwelling fire in Middletown Twp. . Chief 8 reported fire in the basement of a balloon framed dwelling. Ladder 65 assisted with overhaul of the first floor. Ladder 65 was added to the scene of a building fire on Progress Drive Tuesday afternoon. 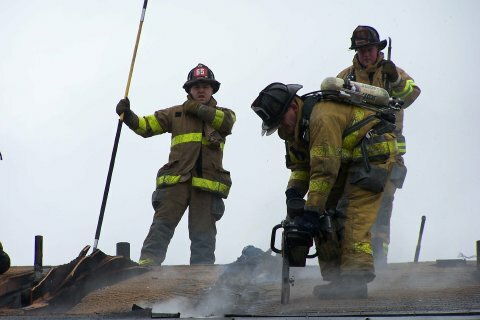 Deputy 11 reported a fire on the roof of a commercial building. The initial alarm companies were placed in-service, Ladder 65 AOS and went to work on the roof of the building with Tower 11. Crews quickly extinguished the fire. Deputy 65 arrived on scene with smoke showing from a 2- story apartment building. Ladder 65 arrived on scene and went in-service with truck company operations (interior and exterior), Quint 28 dropped 5 supply line and went in-service with two 1 ¾ waterlines. Chief 65 was assigned interior command and reported a heavy smoke condition throughout the apartment and that the interior crews found the bulk of the fire in a rear bedroom. Crews on the second floor and the roof reported some extension and additional waterlines were placed in-service. Primary and secondary searches were both negative. The following companies were placed in-service by command: Engine 65, Engine 28, Tower 16, Ladder 37, Rescue 84, Medic 186 and 185. The Bensalem Twp. Fire Marshal is investigating the cause of the fire. Engine 16 AOS with smoke showing from a 3-story garden style apartment building (Grandview Gardens Apartments Bristol Pike). Residents reported entrapment on the 3rd floor. Engine 16 went in-service with an 1 3/4" waterline and Quint 28 went in-service with a primary search of the 3rd floor. Chief 28 established Cornwell's Command and added Ladder 65, Engine 65 and Engine 44 to the box assignment. Ladder 65 laddered the building and performed a secondary search of the fire apartment (all searches negative). Engine 65 stood by at a secondary hydrant and advanced their manpower to the fire floor. Other responding companies on the box assignment were Tower 16, Ladder 37, Engine 28, Medic 185. FM 222 is investigating the cause of the fire. 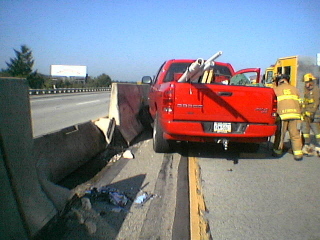 Engine 65 Arrived with one vehicle that had gone off the roadway through a fence into a brick wall. The Engine crew reported 2 entrapped, there were a total of six (6) patients in the vehicle. EMS command requested an additional four (4) ALS units to the scene. E65 & E84 were in service and removed both entrapped subjects. L65 & R4 were also on location and assisted with manpower and lighting for 22pd. Deputy 65 arrived on location with a one vehicle MVA , pickup truck versus center median. Engine 65 & Rescue 4 went into service with a passenger side door pop freeing the driver and one passenger. Both were transported to Abington Hospital. 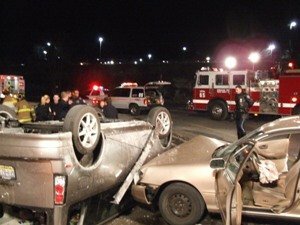 Engine 65 & Rescue 16 were transmitted for an auto extrication early Sunday Morning , 22pd was on location confirming one (1) entrapped in an overturned vehicle that rolled off the roadway. Upon arrival E65 stabalized the vehicle. Once the vehicle was secured E65's crew was able to remove the driver prior to the arrival of R16. The driver was transported to Frankford Torresdale. Chief 65 arrived on location with heavy smoke showing from the 3rd floor of a 3-story apartment building. Quint-28 and Engine 65 both dropped in from hydrants and went in-service with an 1 3/4" waterline and search and rescue. Ladder 16 was assigned to open up the roof. Interior crews reported heavy smoke and fire in Apartment # 5 with extension into the roof. Engine 37 was assigned to stretch an additional 1 3/4" waterline to the exposure apartment. 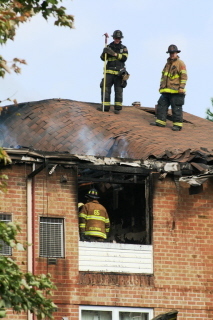 The primary search was negative but the fire had extended into Apartment # 6 and throughout the attic of Building 139. Command placed all hands in-service. During a secondary search of Apartment # 5 a member of Engine 65's crew located 2 victims in a rear bedroom. Both victims (a 4 year old boy and a 2 year old girl) were unconscious and in respiratory distress. The victims were rushed to awaiting medical crews from Bensalem EMS who transported both of the children to FTH. (The children were later transferred to Temple Children's Hospital) Command requested the 2nd Alarm and advised the county to have all of the units from the 2nd alarm to stage on the main driveway of the complex. The Bensalem Twp. Fire Marshal's Office along with Detectives from the Bensalem Police Department are investigating the cause of the fire. Deputy 65 AOS of a 1 vehicle rollover MVA just inside the Philadelphia City limits. Deputy 65 confirmed nobody was entrapped but had Engine 65 proceed in and assist Bensalem EMS with patient care and controlling the hazardous from the accident. Philadelphia County Engine 22 and Ladder 31 proceed into the scene as well to assist Engine 65 and Medic 186. Assistant 28 AOS of a two vehicle MVA and reported one patient entrapped. Engine 65 went in-service with stabilizing the vehicle and Rescue 16 went in-service with removing the driver side door (Engine 28 stood-by). 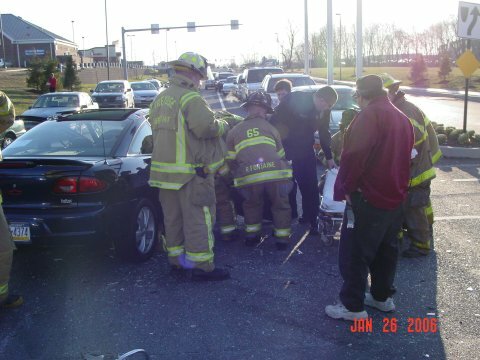 All patients involved in the MVA were transported by Bensalem EMS (Medic 186 and 185) to local hospitals. 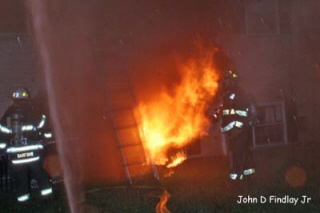 Photo By: John D. Findlay Jr.
Engine 37 AOS of a 3 story garden style apartment with fire on the first floor. Ladder 65's crew was put into service truck company operations in the courtyard ( side C ). The fire was contained to one apartment , FM222 is handling the investigation.